A PATRIOTIC Bahraini father is to stage his own national tribute, with a marathon horse-ride from Oman to Bahrain. Bapco security officer Khalid Abdullah Hussain will first travel to Muscat by road along with his horse. He will start his journey on the Omani National Day on November 18 and arrive home for Bahrain's National Day on December 16. Mr Hussain, a keen rider, last year accomplished a 43-day bicycle ride all over the GCC, to "create a one-family spirit". "I have the full support and backing of Bapco chairman Shaikh Salman bin Khalifa Al Khalifa," he told the GDN yesterday, as he went around Seef area astride his horse, sporting the Bahraini and Omani flags. "I am happy that I am doing this as a mark of honour and respect to Oman and Bahrain, which have close historical and family ties dating back to more than 100 years." He said his road trip to Muscat had been taken care of by Bahrain Royal Equestrian and Endurance Federation president Shaikh Nasser bin Hamad Al Khalifa. "I have been provided with a custom-built transport that will carry my horse across Saudi Arabia and the UAE, en route to Oman." Mr Hussain is married, with two daughters, aged nine and 11 and a six-year-old son. He said he plans to 'do something' to honour Prime Minister Shaikh Khalifa bin Salman Al Khalifa next year and then go on to represent Bahrain in the International Show for the Arabian Horse, Muscat, in 2010. Mr Hussain said General Organisation for Youth and Sports president Shaikh Fawaz bin Mohammed Al Khalifa had been instrumental in encouraging him to undertake his latest mission. "I am doing it for the glory of Bahrain and Oman and as a contribution towards the close links between the two countries," he said. The endurance race will begin in Santa Fe, and, 800 miles and 13-dusty days later, will come to an end in Independence, Mo. The path will mirror that of the Santa Fe Trail, a pathway that ran from Franklin, Mo., to Santa Fe from 1821-1880. The race route will traverse country that reaches as high as a mountainous 7,721 feet to a low of a flat plain 931 feet. KUALA TERENGGANU: With several major events lined up, the monsoon season will no longer be a time to stay indoors. Pulau Duyong will be buzzing with activity when the Monsoon Cup is held there from Nov 29 to Dec 4. Since last year, the world-class sailing tournament has been a major tourist draw, and the strong winds and rough seas are just right for an exciting race. This year?s event is going to be even bigger, with more prize money on offer. Locals can also expect to do roaring business as they have been given additional space to ply their trade in Pulau Duyong. "The Monsoon Cup is just one of the events which will be held during the monsoon season," Menteri Besar Datuk Seri Idris Jusoh told the New Straits Times. "There will be several other events to make the people enjoy walking in the rain. For the petty traders, the wet season will bring them even more business. "The fishermen and farmers should also think of activities that will generate income. They could promote homestay programmes during this period. "It is not the Songkran water festival (in Thailand), but our wet spell is definitely wetter than Songkran. "We want the people to work and have fun all year long, and not just for the first eight months," he said. Another major event lined up is the Sultan?s Cup Terengganu Endurance Challenge, which will be held over two days from Nov 25. The event is expected to draw the best horses and riders from all over the world. It will be the first event of its kind to be held in a tropical climate, and the wet season is expected to make it even more challenging. A string of events will also be held in late December to usher in the New Year, which is also Visit Malaysia Year. In 12 years, Ruth Anne Everett of Hickory has logged thousands of miles from the back of a horse, participating in endurance rides for equestrians throughout the United States. "I enjoy being outdoors," she said, "and endurance riding has given me the opportunity to see some of the country's most beautiful sights while on horseback." While Everett's participation in the sport has allowed for scenic rides along equestrian trails in parts of Tennessee, Florida, Kentucky and Virginia, for her, endurance riding is more than a chance to see the sights. This year alone, Everett has logged 620 miles in 12 different rides. In September, she won first place in the Biltmore Fall Fling, a 55-mile endurance ride held annually to benefit Mountain Hopes, a therapeutic horseback riding program in Mars Hill. "The Biltmore Fall Fling is a tough course," Everett said. "This year, there were 51 riders to participate, one-third of which were eliminated." Everett's standing in the sport of endurance riding has enabled her to qualify for the National Championship, an event scheduled for Oct. 22, in Fort Valley, Va.
"It's a sport of strategy," Everett said. "A rider has to condition the horse to go the distance. You have to pace the horse throughout the ride and factor in things like terrain, weather conditions and even distance traveled from home. "It's much different than racing a horse," she said. "You have to know the horse's limits and his abilities on that particular day." According to Everett, endurance rides, or races, vary in distance, but are typically 50 or 100 miles. Longer rides can take place throughout the course of the day. As with any race, the horse with the fastest time wins -- but there is a catch. "There are checkpoints along the way where a vet monitors the horse's heart rate and overall fitness," she said. "The horse has to be declared fit in order to continue." Riders are eliminated when their horse exhibits lameness or metabolic problems, Everett said. "I wear a special type of watch to monitor the horse's heart rate throughout the ride," she said. "To pass the vet's check, the horse's heart rate must be at 64 beats per minute. 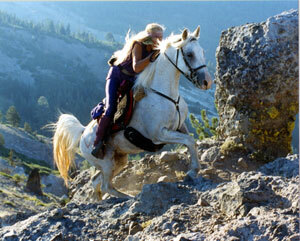 At the end of the ride, the horse must have a heart rate of 64 beats per minute to finish the ride." Everett's husband, Mike, is also an endurance rider. The couple have four horses quartered at Leatherwood, an equestrian community in Wilkes County, where there is an abundance of mountainous terrain for conditioning their horses. The equestrian trails at Leatherwood are Everett's favorite to ride, she said. And her horse of choice is a 10-year-old Arabian named Pretty Boy. 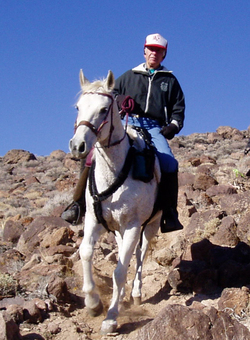 In addition to endurance riding, Everett is director for the Western N.C. Early Intervention Program for Children who are Deaf or Hard of Hearing, a program that provides services for families with children ages birth to 3 that have been identified with a hearing loss in order to minimize language and communication delay. The International Equestrian Federation (FEI) has fined British endurance rider Alice Beet and a company owned by Sheikh Mohammed after a failed dope test by an endurance horse. The case is a warning to riders of loaned horses. Alice, 19, a member of the British young rider squad, has been fined 500 Swiss Francs (£210) and banned for three months by the FEI after the horse she borrowed from Sheikh Mohammed for the World Young Rider Championships in Bahrain last December tested positive for an anti-inflamatory steroid. Sheikh Mohammed's company, Atlantic Endurance SARL, under whose banner he loaned the horse, Harmatan De Lozere, was fined SFR1,500 (£640). The FEI's judicial committee accepted the horse was under the exclusive care of Atlantic Endurance SARL's employees until the morning of the event and agreed it was "most likely" the substance entered the horse while in the "owner's" care. The company "merely stressed no wrongdoing was done by its staff" and provided no explanation for the positive test. Alice Beet is an experienced international rider, and finished 38th in Bahrain on Harmatan De Lozere. In written evidence, she stressed she had no access to the horse other than to exercise it before the ride. The committee heard testimony from Britain's chef d'equipe and team vets, and Sheikh Mohammed's trainer Ismail Mohammed, who described Ms Beet as "a sensible and dedicated rider". But the panel found it was for the rider as the "person responsible" (PR) to prove there had not been a deliberate attempt to affect the performance of the horse and that Ms Beet had failed to do so. The panel concluded: "This case highlights the difficulty of cases in which the rider is not the owner of the horse. This is becoming increasingly problematic in view of the relatively high number of such cases that have been submitted to the FEI judicial committee, most commonly in endurance riding." The panel ruled it would be unfair for riders of borrowed horses to be let off, "otherwise blame may always be transferred to third parties". The panel stressed riders must ensure borrowed horses were free from prohibited substances. It suggested riders obtain written statements from owners agreeing to take full responsibility if banned substances are found and seek blood tests. Ms Beet, in written evidence to the panel, said: "I have learned from this experience and in the future, I will take hands-on control of the diet and security for any horse I have agreed to ride." THE Sultan's Cup Terengganu Endurance Challenge, scheduled for Nov 25- 26 at the Terengganu International Endurance Park in Lembah Bidong, Setiu, is expected to attract more than 100 competitors. Tournament organising chairman Datuk Hamzah Muhammad said endurance riders from countries such as Australia, Thailand, Indonesia, South Korea and Brunei will compete. He said the competition, sanctioned by the the Federation Equestre International, made its debut at the same venue last year with 115 riders competing in the 10km, 26km, 30km, 40km, 8km and 120km race categories. "This time, there will only be 80km and 160km challenge categories to be contested while the 26 and 40km races will only be offered to local novices. "The main event in which the best of riders will take part in is the 160km race. "This gruelling event will take about 21 hours to complete," he said. "Most of our riders will be competing in the 26km, 40km and 80km races as they have to complete the shorter range course before qualifying for the main event which is the 160km course. "We need a large number of local riders to qualify for the 160km race as we will be hosting the World Endurance Championships in 2008," he said. Two of Australia's best endurance riders will be in action when the NSW State Championships return to the popular Windeyer course this weekend. This year's event is being hosted by the Windeyer Progress Association Endurance Ride Committee. Committee Secretary/Treasurer Mick O'Hare said yesterday that two riders who have just returned from representating Australia at the World Titles at Arken in Germany were among the 70 nominations for the ride. "They are Brad Semple, who is one of 10 riders who are coming from Queensland and Jennifer Gilbertson from Wiseman's Ferry who is no stranger to the Windeyer course," O'Hare said. "Another interesting rider is a former winner of the State title when the ride was held at Windeyer Stuart Hitchcock from East Kurrajong. "Three local riders have also nominated for this 160 kilometre event. 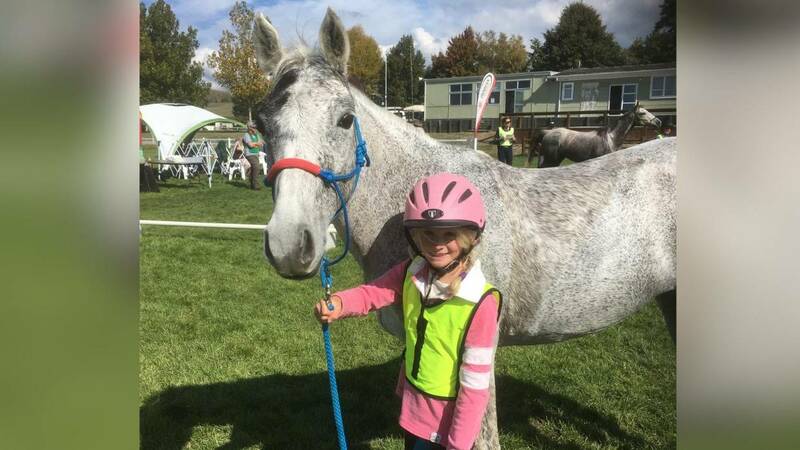 "Gloria Mills, who warmed up for this event with a win at the inaugural Quirindi ride, along with Kate Pilley and Bernice King will carry local hopes in this major event. "We are delighted to have such a strong entry for the ride as we were only expecting 50 when we first took on this year's event." New rules to meet OH & S requirements mean there has to be some changes to the course but O'Hare said these changes will make the event a little easier to organise and should be easier on competitors. The Windeyer recreation ground will, as usual with Windeyer rides, once again be the base for the ride with riders returning to base after each leg of the cloverleaf course. "The Windeyer recreation ground is a great spot for spectators to come and keep an eye on preceedings," O'Hare said. "There are also good vantage points on the public roads along the course but spectators who want to watch from these places are asked not to hamper riders or traffic in these areas. O'Hare said that while the creeks and water holes may have dried up, organisers have arranged for plenty of water for competitors and their steeds to be available throughout the course. Head vet this year is Kyn Hagan from Kempsey, who will be assisted by Ray Gooley of Mudgee, who has become a legend in this role among the endurance community. The ride commences at 2am on Sunday morning and riders have 24 hours to complete the course. The fittest horse test will take place at 8am on Monday morning and presentations to the winners and buckles to those who complete the course will be presented at 10am on Monday. Sponsors of this year's event are RD Hooper Engineering, Landmark Mudgee, Kelletts Stockfeeds, Price Farm Machinery, Woolprep, Windeyer Hotel, Pat Pilley Earthmoving, McCarroll Motors, Greg's Tyres & Mechanical, Mudgee Rural Supplies and Ian Colley Earthmoving.